What’s your favorite breakfast? Are you team sweet or team savory? Maybe you are eating oatmeal for breakfast every day and want to try something new? 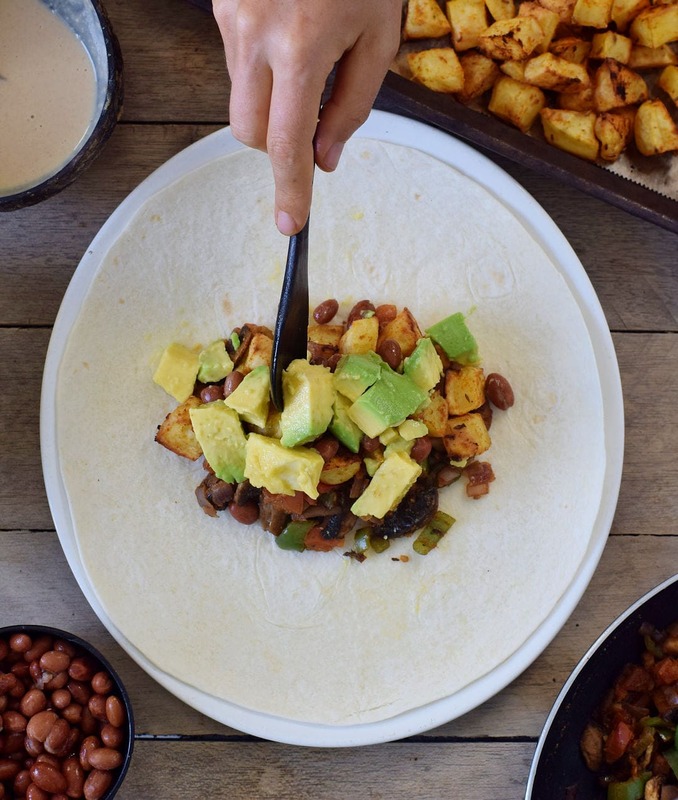 If yes, then look no further and give these vegan breakfast burritos a chance. They are hearty, savory, flavorful and loaded with lots of good stuff like roasted potatoes, beans, mushrooms, and avocado! Did your mouth already start to water? I would say let’s check out this plant-based breakfast goodness right away. 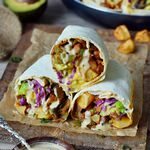 I love roasted potatoes, they are crispy, satisfying, and simply perfect for these delicious vegan breakfast burritos. They are furthermore super easy to prepare, you simply need to toss them with some spices and a little bit of oil, and bake them in the oven until golden brown. In the photo above you can see the potatoes before baking and in the following photo, you will see how good the looked after baking. I added whole cumin, smoked paprika, onion powder, salt and pepper to taste. You can, of course, also add cayenne pepper to make them spicy and hot! Also, it’s totally possible to use sweet potatoes instead of regular potatoes. 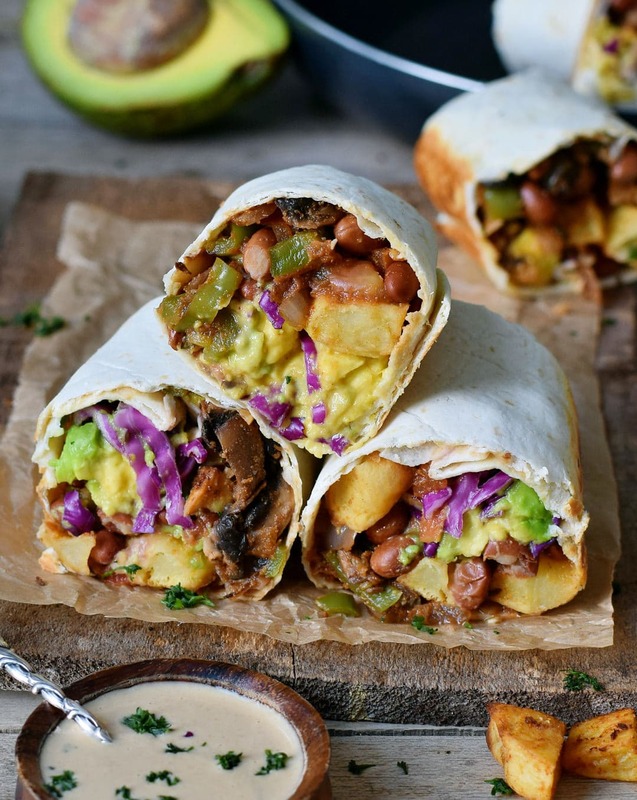 These vegan burritos are amazing for a healthy protein-packed breakfast or brunch! I used only simple ingredients for this recipe. Kidney beans are one of them. You can also use black beans, or even chickpeas instead. Furthermore, I added tomatoes, peppers, mushrooms, onion, garlic, and avocado. If you aren’t a fan of e.g. mushrooms, simply leave them out and use something different instead, for example, zucchini. Another big bonus is that you can prepare these vegan burritos ahead and freeze for busy mornings. All you need to do is wrap the prepared burritos in aluminum foil, place them in Ziploc bags and put them in the freezer. You can heat them up in the oven until crispy or for about 3-4 minutes in the microwave (please remove the tin foil before you put them in the microwave). 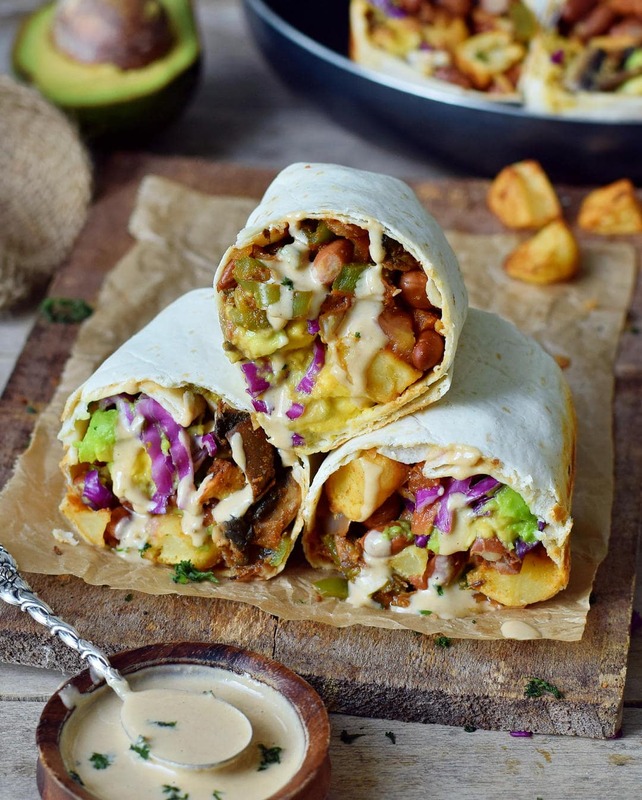 A good creamy sauce is a must for these yummy vegan breakfast burritos. And the great thing is that it’s super easy to make. All you need is cashew butter, some spices, hot sauce, and water. To make the sauce nut-free you could use sunflower seed butter or coconut butter. You could also make the sauce with cashews instead of cashew butter. So, if you have cashews at home, then check out the cashew sauce in THIS RECIPE. If you make this delicious breakfast then please leave a comment below and let me know how it turned out! And if you even take a photo of it, then I would love to see it. You can DM it to me on Instagram. Don’t forget to tag me in your Insta caption + photo with @elavegan and use the hashtag #elavegan and I will gladly check out your post. If you love hearty snacks, definitely also check out my spicy Buffalo Chickpea Taquitos! 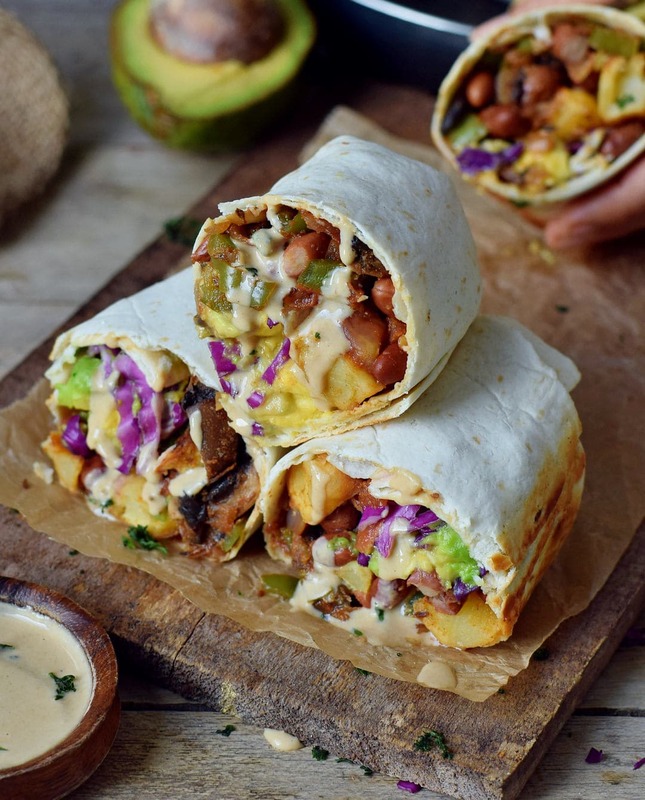 These vegan breakfast burritos are loaded with roasted potatoes, avocado, mushrooms, pepper and are great for a healthy protein-packed breakfast or brunch! They are easy to make with simple ingredients. Are you tired of oatmeal for breakfast? Then try these savory breakfast burritos. Preheat oven to 400 degrees F (200 degrees C) and line a baking sheet with parchment paper. 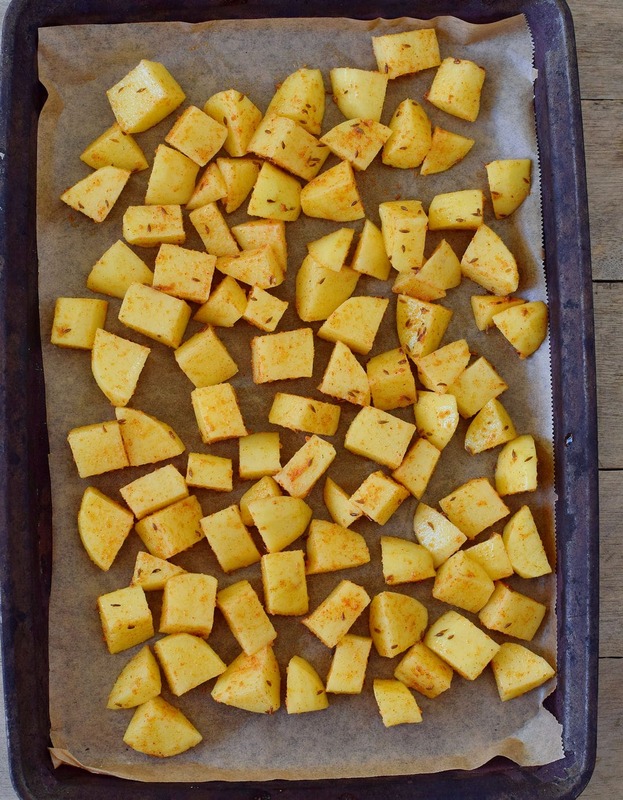 Chop potatoes into 1-inch cubes and put them in a bowl. Add the other ingredients for the roasted potatoes. Toss well to coat and transfer the potatoes onto the lined baking sheet. Bake in the oven for about 30 minutes or until cooked through and golden brown. To make the cashew sauce, simply mix all ingredients in a bowl with a whisk until smooth and creamy. While the potatoes are in the oven, chop mushrooms, onion, garlic, tomatoes, pepper, avocado, and red cabbage. Heat 1/2 tbsp oil in a skillet and add onion, mushrooms, and pepper. Cook on medium heat for 5 minutes. Add the spices, garlic, tomatoes and cook for a further 1-2 minutes. 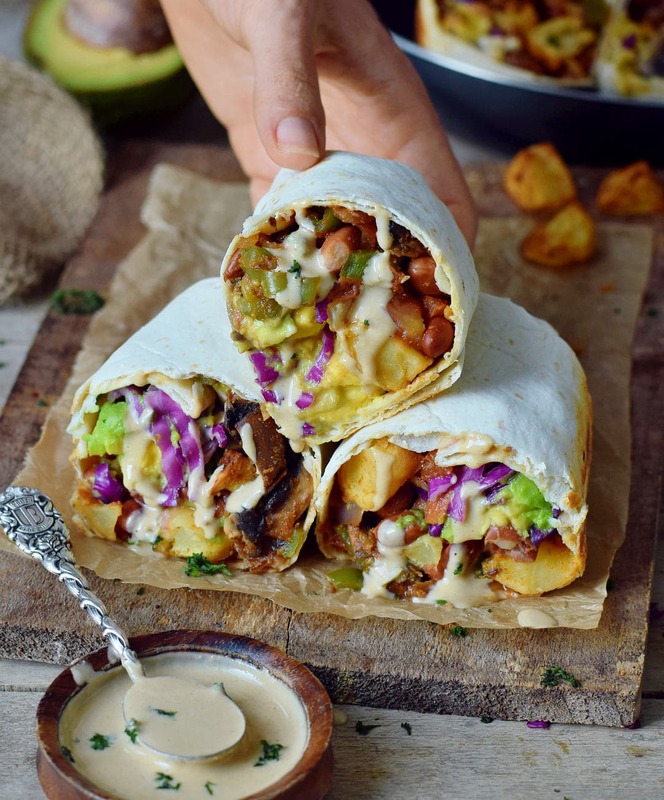 Toast a tortilla and place about 2-3 tbsp each of the veggie mixture, the beans, the roasted potatoes, the avocado, a little red cabbage and cashew sauce onto the tortilla. 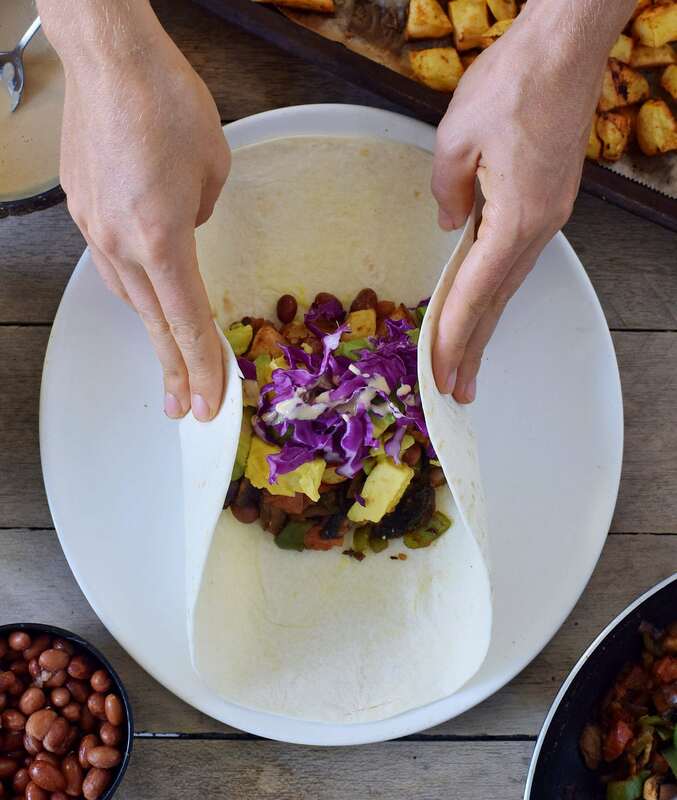 Roll the burrito up by folding the sides inward and the edge closest to you over the filling, pulling tightly. Once you rolled up all burritos, toast them in a pan for a few minutes until crunchy an golden brown. Enjoy! Check the blog post to find out how to freeze the burritos. This looks amazing!! I can’t wait to try- thank you so much! Do you have the total calories per serving available? Hello Lucia, no I don’t because it depends on which kind of tortillas you are going to use for the recipe. Yummm! 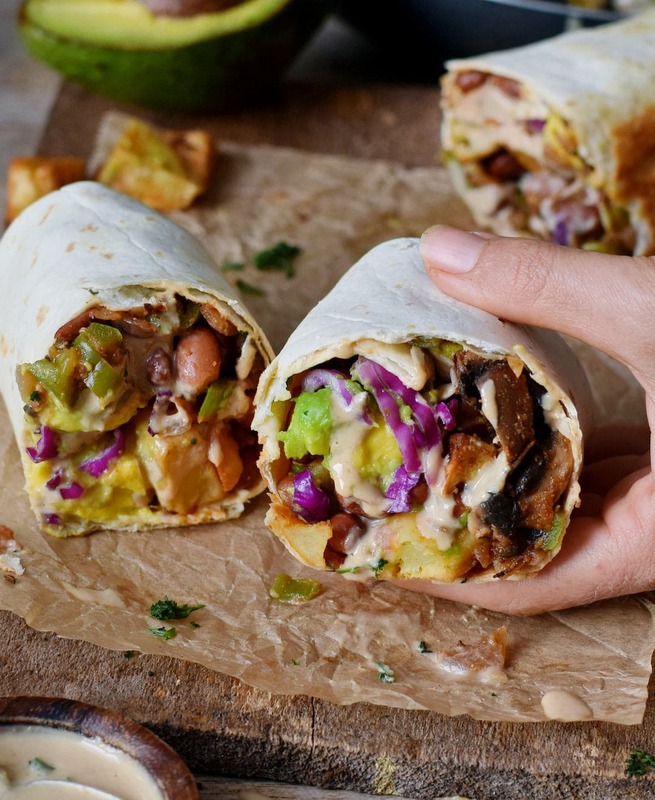 You had me at burritos…These sound and look like such a healthy indulgence! ???? Another great recipe! I just love all of the ingredients you have used in these burritos Ela! So yummy! Hi Ela, your recipes look amazing! I recently had open heart surgery and decided it’s best for my health to go plant based or vegan. My only go to’s for breakfast have been green juices or overnight oats and I’ve been fine with them. I am in the prcocess of collecting recipes and this one is the only one that I am now excited about trying next. Thank you for posting and sharing, God bless you! This recipe looks amazing. Can’t wait to try it this weekend. What size tortillas do you use? Im so happy that I could find this page because in China most of blogs are blocked and is hard to find all we need. I am so inspired to start some health diet (im vegetarian ) but I really hope to go back vegan! Which tortillas did you use? I normally use my homemade tortillas but for this recipe, I used store-bought ones.